There is a new round of Enchantment and this time it takes its inspiration from Lord of the Rings and the designers offer everything from orc-inspired skins to robes fit for an elven king. I am showing you a beautifully textured dress from Senzafine and a set of chairs from Roawenwood with clear elven inspiration in the elegant lines. Additionally, I am wearing another piece from the current round of Redeux (remember, that one is only open for a week! ), an intricate necklace from On a Lark. Finally, the hair is Cayden from Wasabi, released as a male style but as you can see it works fine for a female avatar as well provided that you don’t have too large a chest (there’s only two size options for the chest). I felt like it was time for a touch of magic, so I donned the Obscuritas crown from lassitude & ennui on top of my Inoko hair from Wasabi and conjured up some magical auras with a bit of help from the Dreaming Thicket. I performed my incantations in the gothic Rhordyn Towertop Skybox from Trompe Loeil, which offers a vast, cathedral-like space with huge windows at either end. Along the sides, there are stone alcoves that can be used if something less expensive is desired. I have been just a touch distracted this last week, since Elio and I got a chance to try a demo of Reigns: Game of Thrones which has proven completely addictive. As a result, I have barely had any time left for Second Life. 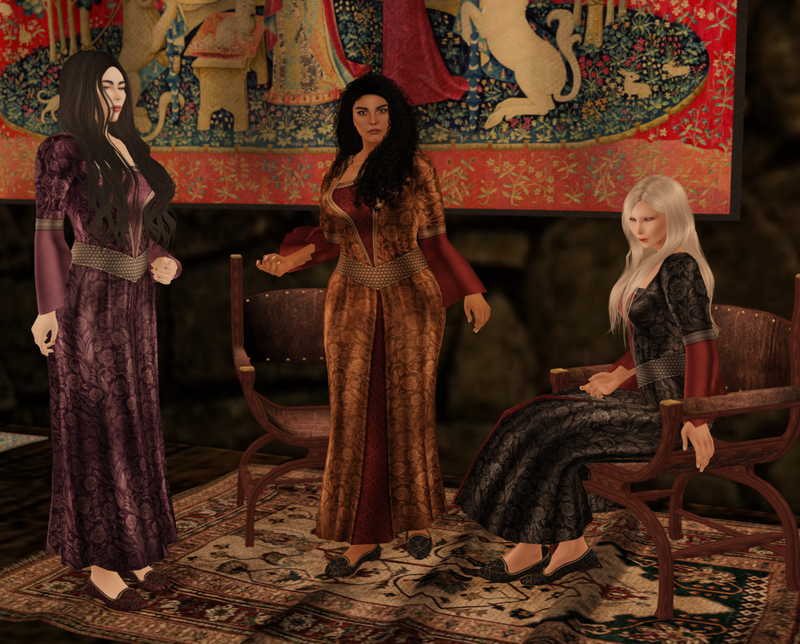 But, as I did have some new releases to share with you, I’ve stopped my attempts at ruling the Seven Kingdoms successfully to bring you a look at some fresh new things from Senzafine, Wasabi and alaskametro. Sometimes, it is a struggle to come up with a good idea that results in a pleasing image at the same time as it shows off the item(s) being blogged in a good way. Other times, the idea leaps into your head almost fully formed. That was the case when I opened the latest blogger pack from the Dreaming Thicket, the Ladies’ Crowns Gacha from the Fantasy Gacha Carnival. 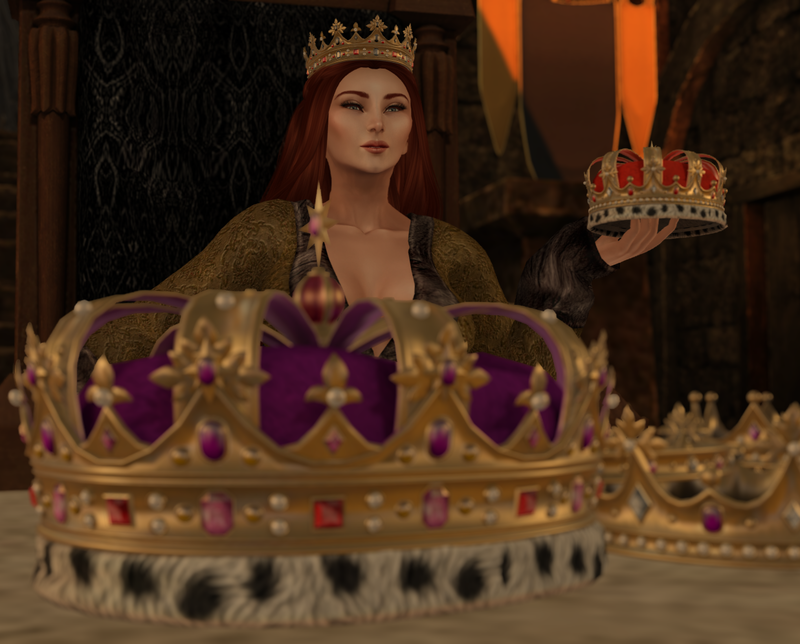 The idea that came to me was of a woman on a throne, wearing one crown but choosing from a selection of others, including some more “powerful” ones. As soon as I unpacked the Memorial Monument set from Artisan Fantasy, I knew I wanted to do something with it, but it took a while before all the pieces came together. However, once I received the Rihtual set from the Plastik as well as the Helianne headdress, I had an idea for how I wanted it to look. Of course, then it ended up spending an hour testing windlight settings and remodelling my surroundings because the framing of the shot just didn’t come out as I had imagined it. Sometimes it can be a bad idea to have too strong an image in your mind before you setup a shot and this was definitely one of those times. I finally arrived at something that I was mostly pleased with, even if it wasn’t quite what I had wanted from the start. No Fantasy Faire post from me yesterday as both Ran and I were busy doing not just one but two LitFest events for their George R.R. Martin day. 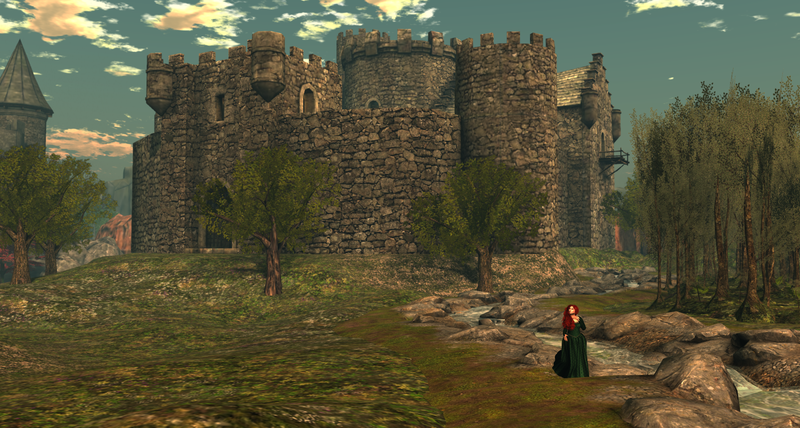 First was a presentation we did together (with the excellent Saffia Widdershins as moderator) about how we ended up collaborating with GRRM and some of the things that has resulted in over the years. At the end of it, Saffia invited us to also take part in her panel discussion on adaptations, which given the theme of the day was focused on A Song of Ice and Fire/Game of Thrones. It turned out to be a lot of fun so we were glad we stayed up for it. But it didn’t leave much time for blogging, so what you are getting today is a look at my outfit from the LitFest. I am taking a brief break in my Fantasy Faire coverage to take a look at a gacha collaboration between Stealthic and Toksik called the Off-Stage collection. The hair is of course made by Stealthic and the photo studio, backdrop and various props (lights, toolbox, ladder, chair) by Toksik. The rares are the hair and the photo studio itself but there are several other pieces that you can use on their own as well. The backdrop, for example, makes for a nice photo backdrop and all the lights are functional light sources. Lost cities, ruins, mysteries. The past has fascinated me since I was quite young and while I know now that archaeology is rarely about discoveries like Knossos, Mycenae and Troy, it is still fun to let your imagination run wild at times. This is why I just had to have the latest add-on to Fanatik’s cave system, the Petra Chamber. Inspired by the Petra site in Jordan, but placed within a vast underground chamber instead, it looks just amazing. So, of course I had to do a video of it. Do note that this is just about the Petra Chamber, as I don’t actually own the rest of the cave system. For interiors, it can definitely be used as a stand-alone, though I am sorely tempted to get the whole system and the other add-ons too.